Though a couple of these cuts are available on our compilation CD's, we are now offering the complete JATP program, available for the first time anywhere, on one compact disc. Gene is at his best here with some of his best sidemen. 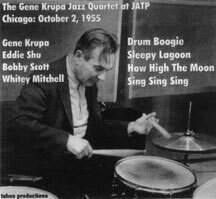 Eddie Shu, Bobby Scott, and Whitey Mitchell wail on Drum Boogie, Sleepy Lagoon, How High the Moon, and Sing Sing Sing. Whitey Mitchell himself just heard this for the first time in 46 years and could only say, I never realized how great Gene really was!